Diaper Dawgs Giveaway! Ends 6/14. 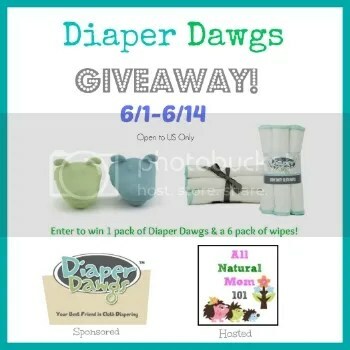 Welcome to the Diaper Dawgs Giveaway sponsored by Diaper Dawgs and hosted by All Natural Mom 101. One lucky reader of rays of bliss and All Natural Mom 101 will win one (1) 2-pack of Diaper Dawgs & one (1) 6-pack of Heavy Dooty cloth wipes. Both in the Milo & Buddy Color. The Giveaway Starts June 1st-June 14th. Be sure to check out All Natural Mom 101’s Reviews on Diaper Dawgs HERE and the Heavy Dooty Cloth Wipes HERE. Enter the giveaway via Giveaway Tool below. I thought that they would but they actually dont… i look forward to change her diaper! Dirty diapers don’t usually gross me out but if I come across a diarrhea diaper….I totally gag. Not really, it’s no worse than dog poo!! No, they don’t gross me out. Dirty diapers do not gross me out. I have two dogs that I have to pick up after and helped with diaper duty on my little brothers.